Over the years, we’ve seen a revolution in how labor is supplied because of technology. First, we saw simple outsourcing—taking one person doing one job and moving the job over to a cheaper person in another geography. That only worked because you could connect everyone via technology—routing phonecalls, e-mails, design documents, etc. halfway across the world so that working with someone in India was as seamless as if they were on another floor in your building. As emerging markets start to achieve more equality with the rest of the world in labor cost, that arbitrage starts to go away. The best people start to charge more, or they simply move to the US, and the time and efficiency cost of working with labor for less complex tasks starts to not be worth it anymore. To gain next level efficiencies, we worked on breaking up the tasks that go into a job. If you have two people, a highly skilled worker and an entry level person, if you could microchunk the simpler tasks, move them over to the entry level person, and make the highly skilled person not only more productive but probably happier. 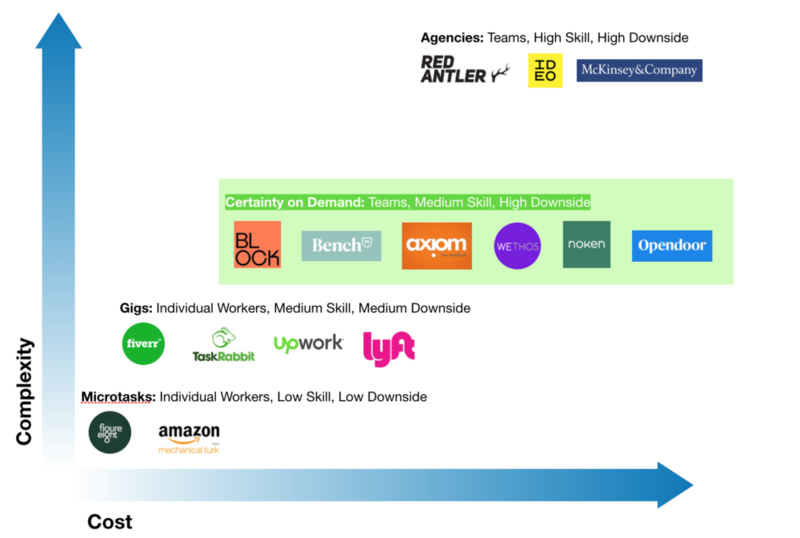 That gave rise to platforms like Amazon Mechanical Turk on the simple task side of the spectrum or marketplaces like Upwork and Taskrabbit where you want someone a bit better, but the tasks are still pretty straightforward. In all of these cases, workers are working as individual contributors—while one person might be managing multiple people, the workers are not connected to each other as a feature of the platform. Uber and Lyft largely work the same way. Driving is obviously a more complex task than identifying whether an image has a puppy in it, but lots of people can do it, and as long as the driver doesn’t crash or kill you on the way to the movie theater, you’re pretty much ok getting anyone. If you needed anything done by someone not in your employ for anything more complicated, you are basically looking at some kind of agency work—because more complicated work generally requires teams of people working together. For the longest time, teamwork was inefficient—requiring lots of overhead in planning and setup to get a team with a variety of skills all on the same page and working together on a complex project. Every new job or set of tasks was treated as unique and constructing teams was viewed as a challenge—so agency work from McKinsey to IDEO, or your corporate law firm, was very expensive. That’s starting to change as companies realize that for many aspects of teamwork, 80% of most work frankly isn’t that hard and looks somewhat similar to a lot of the other work. You could build semi-rigid operating plans that cover most of the jobs that come through. Take Block Renovation. Block takes the stressful and sometimes disastrous process of remodeling and makes it simple. Instead of going out into the market and getting a contractor, which is essentially an agency, and an architect (another agency), it focuses on the 80% of bathrooms where all you’re doing is just taking out old stuff and putting in new stuff. They preselect the inventory of fixtures, create standardized pricing, and vet for the basics of contractor reliability—has references, is licensed, etc. The bar is lower here because the jobs are simpler—and the worst aspect of having work done, the price negotiation, is done upfront. They’re eliminating the work that a customer needs to do in a marketplace—the sorting, vetting and labor management—and turning it into a service with something of a guarantee, which puts the marketplace aspects on the backend under the management of the company. In short, they’re offering Certainty on Demand—a term coined by Michele Serro, the founder of Doorsteps. If your job fits their criteria, they’re selling the certainty that at the end of X time, you will definitely have a new bathroom. That’s much easier to do when you’ve taken apart the process and put it back together again in a way that optimizes for getting to the finish line with certainty over and over again at scale. Investors took notice and gave the company over $4mm in its seed round. It’s a model that is starting to get repeated in the market. Bench looked at the process of bookkeeping, realized that 80% of the clients had the same simple, straightforward set of needs, and built in automation to service them more efficiently and less expensively than an accounting firm that treats every new client’s set of needs from scratch. Noken replaces a traditional travel agency quite effectively for 80% of the trips in the market where the person is going to a new country wants to see all the stuff that everyone agrees you should probably see. At the same time, they figure out which customer decisions are major consumer satisfaction leverage points—like the quality of the hotel. Just a handful of choice can make an automated process appeal to the vast majority of the market. These platforms enable automation to solve higher order problems effectively, driving above market revenues for lower cost tasks. Consumers are thrilled with the experience, which often seems like “magic” that they are being served so well on such “low” costs compared to full service agencies. Axiom does this for law—providing “the same” legal service for way cheaper because it has filtered which tasks it makes sense for it to do and has more throughput than a traditional legal firm. Wethos is now doing this for a variety of higher order labor outsourcing—like website design, PR campaigns, or social media marketing. Creating a new website isn’t a job for just one person—someone needs to think about the site copy, someone else needs to do the visual design, and someone else needs to do the front end coding necessarily to implement that design. There are a multitude of higher order projects that fit this same pattern—too complex for just one person, but 80% similarly structured to a million other similar projects that came before it. Instead of paying for a full on agency with all its custom overhead, Wethos can quickly spin up a group of people from its curated talent network, give them a framework for collaboration, and help you accomplish your goal for a serious discount to a traditional agency. The full potential of a creative agency is something you wouldn’t have taken advantage of with a project like this—much in the same way that Block Renovation doesn’t need to hire an architect for every new bathroom they give a facelift to, Moving curation behind the curtain is key, too. Why outsource the selection of the talent to the customer when the platform knows who is actually good? The exciting aspect of these startups is that they can turn on revenues from day one—they often experience solid margins from the beginning, and those margins improve over time as they expand the number of playbooks they research and implement. Wethos will add more verticals of work. Noken will add more countries. Block will do kitchens one day and the list goes on. Labor will find itself able to complete more task, more appropriately funneled to the right level of work, and business will get more efficient, thanks not only to technology but to thoughtful process design. I'm a bit tired of tweeting, donating, protesting, etc. to end gun violence--so I'll take a different tact in the wake of the Christchurch shooting. If you're an investor, employee, or just user of a large media distribution network, please ask the hard questions about the responsibilities of those platforms to prevent the spread of hate and violence--again and again until these platforms take their role seriously. It's just not acceptable that violent people see online platforms as a viable channel for their hate and that, after all this time, the "smartest innovators in the world" still seem at a loss as to how to stop it. How many ways have we heard Youtube tell us that hundreds of hours of video gets uploaded to Youtube every second--and they make it seem super easy, but yet they can't get out in front of people trying to share a mass shooting livestream over and over again? Isn't building an infrastructure to ingest all of those videos with the kind of uptime it has pretty darn hard? Is it really possible that your $500k/year engineers can somehow build the world's best infrastructure but can't be held accountable to figure out how to put a safety on the damn thing when someone wants to use it as a weapon? This is what happens when your tech largely gets built by people at the top of the social food chain--it escapes their imaginations that someone might want to use it to hurt someone else because they're so rarely the victim of anything. Diversity isn't about numbers--it's about changing the way we design our products to better our society. Some VCs peel off of other funds to start their own and they have the benefit of a track record from their previous firm to show. Obviously, that’s ideal, but that’s not where everyone starts. If you’re lacking for track record as a firm, here’s three exercises you should walk through to help turn your pitch and due diligence meetings from guesswork into something more substantive. When I was an analyst at the General Motors pension fund, investing in VC funds, I had to build a model of how I thought they would perform. It started out with initial investment size, pricing, and outcome behavior for each deal and then it made a prediction around the distribution of outcomes. It’s easy to say you’re going to be a 3x fund, but how does the math actually get you there. If you’re not actually modeling this out with a spreadsheet, I don’t know how you can look an LP in the face and say this. Build up your model of what you think the individual financial outcomes will be over time—layer that on with follow-on decisions, fees, carry, etc. I think the results will surprise you how hard it is to be successful. How much time will you be spending on each portfolio company? Taking board seats? For how long? How long is your partner meeting going to be? Will you be going to the gym at all? Spending any time with family? How much do you sleep? You give money away for a living—and so you’re going to get overloaded with requests. Once you do distribute the capital, you’re giving it to companies that will need a lot of help. How will you provide it across 30 investments? Will you have analysts? Partners? Will that increase the work? Figuring out how you’ll spend your fully loaded time is something any LP will want to understand in order to know if you can handle going from just angel investing or doing whatever you were doing before to running a portfolio full time. Here’s what my model said. In the public markets world, when you start a new fund, you backtest it. You take your investment model and run it against the past to see if it would have worked. Want to only invest in diverse boards? Only companies with a certain contribution margin? Maybe you only care about growth. Whatever it is, could you have run that model successfully over the past five years? Not all prior performance is a guarantee—but it would be nice to know if this would have worked in the past. I ask the same of new managers. Had you actually had your fund in the four years prior to today—which deals would you have legitimately been able to do? This is actually easily referenced. For example, let’s say I had a more national fund. Because I had previously met Jack Dorsey through the Union Square Ventures network, in 2009 I was able to grab coffee with him before he launched Square. He demoed the product to me and I wound up being dollars #476 and #477 to be swiped on the very first Square prototype. I was blown away. Had I had a fund, I could have said, “Hey, let me invest in this…” and maybe I could have squeezed $25k into the round. It’s at least plausible—versus being someone who had never met him at all who said they’re starting a fintech fund and Square is the kind of thing they would have invested in. It wasn’t likely that a fund who had no prior connection to him at all would have gotten in. If you’re looking for more tips and advice on starting out as a first time fund manager, you should check out the webinar I’m putting on with Carta next week covering all the basics and stupid questions that aren’t so stupid. They back it up with sensible math—owning 20% of a billion dollar outcome returns a $200mm VC fund, and, of course, you’re trying to at least return the fund. So, no one really questions the ownership model. Yet, when you buy shares of Apple or Facebook, you don’t even think about what percent of the company you own. How then, do you expect to make money when you’re buying on the public market? Seems like that should translate over to the venture world, too. After all, all we’re really doing as VCs is buying shares, aren’t we? How come VCs don’t think about it that way? There are two reasons. First, price discipline doesn’t work in overly competitive markets. When there are too many funds in a market segment trying to do the same deals, keeping your entry price reasonable is going to get you shut out of a lot of deals. If you’re a first check lead VC for pre-seed rounds in New York, you can keep your head on when it comes to price, because you’re not going against that many other people. If you’re in SF trying to fund AI companies from YC, good luck with your price discipline. Second, you can only get so many dollars into “cheap” seed shares. If you raise $100mm, you can’t put it all to work upfront because the rounds aren’t big enough—so you have to deploy more capital later (and more expensively). Dilution becomes the enemy. You tell your investors that you don’t want to own a smaller and smaller percent of your “best” companies. You need to write bigger checks to maintain ownership. What you’re not saying to your investors is that you’re buying more and more expensive shares at a lower return. I guess that doesn’t have the same ring to it. Of course, there are other non-financial reasons to follow-on. Brooklyn Bridge Ventures, my fund, does small follow-ons (10-20% of the original investment) that enable the founder to say that everyone is continuing to participate. That means you might get $400k upfront from me in your seed or pre-seed round when the money is hardest to get, plus a term sheet that helps wrangle everyone else, with a follow on of $50k in whatever comes next. The vast majority of founders are completely willing to get more money upfront when they haven’t proven much yet in exchange for less money later when there is enough risk off the table to get others to participate instead. Also, funds that lead Series A, B, and C rounds have serious capital needs that extend over the life of a company. They’re not only leading larger rounds, but may need to bridge companies they’ve otherwise made large investments into that have higher burn rates. Sometimes, you’re the only one around the table who wants to do a Series B and that requires real cash. That’s not what seed funds are doing. They don’t have enough cash to bridge a Series C round anyway. Seed funds specialize in doing a lot of work for not a lot of money—and I suspect that’s why they’re getting larger. We do the work of sorting through the pitch decks of everyone and their mother, finding the diamonds in the rough, helping them turn an idea into something that looks like a company—and we do it for a fraction of the management fees of our later stage counterparts. The incentive to want a larger fund is real—more staff, better office, better salaries—but the investment strategy of holding back your capital to pay up for pricier shares really doesn’t make much sense from a returns perspective if you ask me. I took the time to model out some returns using share price as a basis—to figure out if the price you’re paying when you buy up is worth the difference in the outcomes. Here’s a very plain vanilla model. It doesn’t take into consideration fees, carry, options, down rounds, or recaps. It’s just a model of the share price of a company going up and to the right smoothly until it exits for $300mm, and the outcomes for the shares purchased in each round of financing. Seed round investors get a tidy 18.2x return—which means in this model I’d return half my $15mm fund on one $300mm exit—since I front load most of my investment into the first round and write checks of $350-400k. Later round investors who pay up get less, obviously. Keeping fund size the same, they also wind up putting less into the first round of their winners while at the same time putting less into the losers. They hold their cash back until they have more data, and lean in as a company is outperforming. That creates a tradeoff of paying up for more information. How much do they hold back? This is the data of what your investment dollar distribution looks like if you’re doing the pro-rata of each of these rounds. Obviously, if you’re only doing the seed, you’re putting 100% of the fund into the seed. If you’re holding back to do your pro-rata in a seed+ round, you’re holding back about 32 cents on the dollar and putting 68 cents in upfront. Doing your pro-rata in the Series A? That means you’re only going to get 37 cents into the cheapest round and you’re holding back the other 63 cents for later, more expensive investing. That means your winners are giving you just under a 9x return, because, on average you’re paying twice as much. At least you’re avoiding putting more of these dollars into the losers, through, right? Yes, but you have to be really good at that to make it a better fund overall—like, REALLY good. I created a few fund mix scenarios and estimated what the overall fund return would be given that mix. I don’t like modeling things with billion dollar outcomes because they’re rare and you shouldn’t base your investing on getting one. It’s not unlike what you hear a lot—that about 10% of the fund or so generates most of the returns. Throw in a couple more solid returners, a few singles and doubles, and you’ve paid for the fact that half your portfolio was a complete wipeout. Some call it lucky. I call it disciplined—because you’re buying in cheap enough to make your winners return enough to make up for the duds. If you keep on going through the seed+, you’ve got to be a bit better allocating your dollars. Only about a third of your dollars can go into the duds and you’re up closer to 15% of your dollars going into winners to get the same fund return. This is the dollar distribution of your investments when you do pro-rata through the A. About 37% of your dollars will be in the seed rounds, and if half of them went bust, then you definitely invested more than 15% of your fund in those rounds. Not sure how you get around that math—unless somehow you’re able to know ahead of time they’ll be duds and you put less in them. It begs the question of why you invested in the first place. Obviously, the math and estimates here are super variable, but the point of this is that we have walk right up to the edge of suspending reality to just get the same returns as in the no follow-on model. Imagine what the math needs to look like for this model to be demonstrably better by following on all the way through. Here’s how your dollar into a company shakes out if you’re doing pro-rata across rounds. In a one company model, it’s about 30%—but since half your seeds don’t make it to A, you cut the 14% A round follow in half. I don’t know how many seeds make it to seed+ or how many seed+’s there are, but the point is, you don’t have much margin for error if only 10% of your portfolio is allowed to be invested in the duds. Following on is just really, really hard work if you’re going to get the same returns—and you can’t afford to follow on big into a company into the Series B, C, and beyond and not get a big outcome. That will sink a fund in a hurry. The nice thing is that you don’t need the same returns, because you have more management fees and a bigger fund—so less carry on a larger base is still more money. If you’re a larger LP, you don’t have much choice to put the money to work either. If you need to invest $25mm at a time, you’re still better off in venture capital than in the public market if you can access good managers. If you’re a smaller investor, however, and you can get your check size into any fund—the math points to trying to get into the fund buying in at the lowest average share price across its portfolio. It’s a lot easier to make a better multiple of return there—and if it’s all the same to you check-size-wise, then smaller seems better. I’m sure someone else can build a much better model than I can, and throw in a lot more complexity around return expectations—but to even build a model at all probably makes me top quartile in terms of GP analytics. I’m absolutely stunned at how few managers, especially new ones, ever bother taking a shot at doing any fund cashflow models. Too many times I hear echos of what’s been talked and blogged about without any data behind the thinking. What might work for a larger fund may not hold true for a smaller one—so before you take someone else’s strategy as your own, take the time to do some math around it. Also, we all need to play to our strengths. Some investors are better at dealing with more data—and others might be better “first pitch” hitters. What’s important is that you’ve thought through how good you need to be if the data says you need to be better than average to make your math work.